In the middle of last week I had a bit of a melt down. I felt like I was being pulled in a million different directions and that my to-do list was ever growing. There were so many big tasks that were left undone (our Will is among the list) and open ended and I did not like the way that my lengthy to-do list was affecting the time with my family. 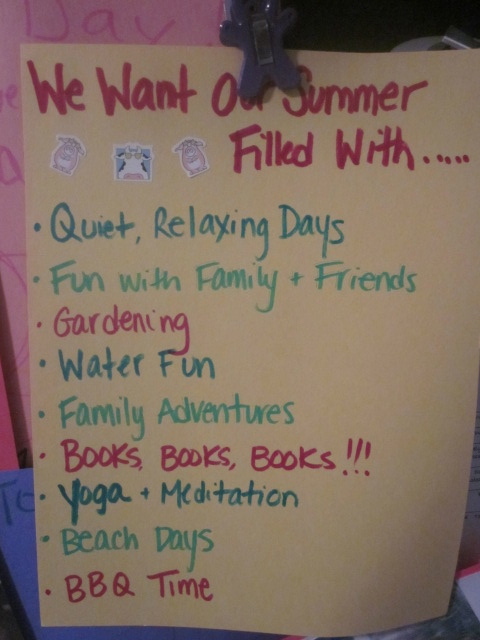 The Summer Calendar was WAY too full and some of the activities written down were more out of obligation or guilt and not because we wanted to do them. I knew that if I didn't do something, then I would look back in September and wish that I left room for more quiet days....the kinds of days that our family needs and craves. The kind of days that I remember from my childhood.....sprinkler fun, licking popsicles, reading books....SIMPLE. Good for you! I might have to do something similar with our calendar because it is looking kind of full! I'm still determined to get my list done.